Whether by design or default … love the “X” marking the spot (in traffic). I’m just happy the planes (if indeed they ‘were’ planes…) didn’t hit. This is an ominous one, Carin. The darkness, and all those cars with unseeable drivers (waiting? 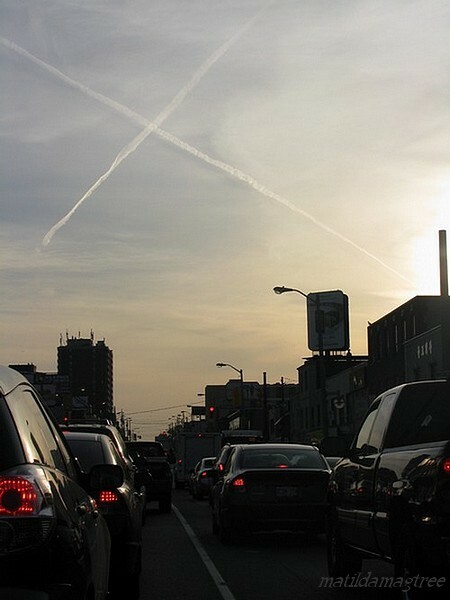 ), and the contrails forming that huge X like a portent. I like the way the white line on the road draws the eye along the rows of cars and then up, where it’s echoed in the X. What a haunting photo. It’s like a photo in a country at war. The light is magnificent, holy! And all this movement and yet not a sign of a person. Yup, I love the white line on the road and the lines in the sky. And that big ambient sky of quiet doom. I really do think the lighting in this, the twilight, and how the sky lingers over, sets the whole tone. Even without the creepy jet cross it would be ominous. Great capture. “… big ambient sky of quiet doom.” Eeep. All that on my way to hear the delicious Laura Smith sing.